As a special “Thank You” for waiting, we would like to extend a 20% discount on all orders made after 12/10. Simply enter the code “GIFT2010” at our Bigcartel Shop or “GIFTED2010” at our Etsy Shop. And don’t worry - your gift recipient won’t have to celebrate the Holiday empty handed. 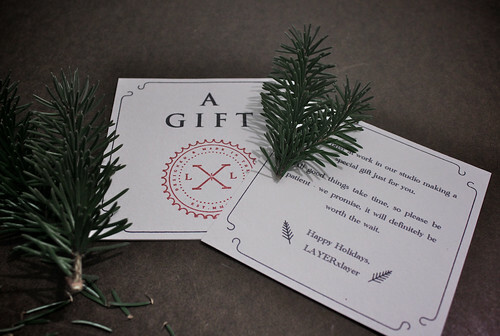 When you place an order, we will send you a gift card printed on high-quality paper, handstamped with our logo and signed by the makers. Handmade envelope included. *Using the discount code before the 12/10 date will result in a deferred shipment date as well. So if you don’t mind waiting, order today.